Cut tempeh into bite-sized pieces and marinate overnight in the teriyaki sauce. Transfer the tempeh with the teriyaki into a pan and bring to a simmer, reduce heat and cover. Grill the pineapple until it has sear marks. Break into bite-sized pieces and set aside. In a large pan or wok add a bit of coconut oil and stir-fry the spring onions, garlic and ginger until fragrant. Add the bok choy and bell pepper. Once they soften slightly, remove and set aside. Add more coconut oil if necessary and place the pan back on the heat. Add the rice and edamame and stir-fry until hot. 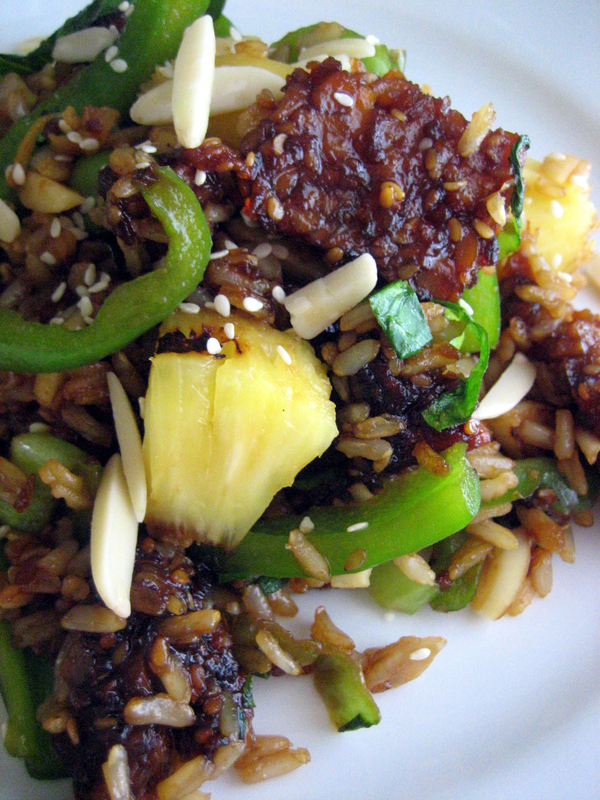 Add the tempeh with teriyaki and almonds. Return all the cooked vegetables and pineapple to the pan. Stir until well mixed. Garnish with sesame seeds. looks amazing. I love grilled pineapple. I do too! Caramelized pineapple is ambrosia.